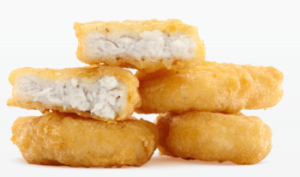 American McNuggets (190 calories, 12 grams of fat, 2 grams of saturated fat for 4 pieces) contain the chemical preservative tBHQ, tertiary butylhydroquinone, a petroleum-based product. They also contain dimethylpolysiloxane, "an anti-foaming agent" also used in Silly Putty. So what you're saying is that 4 McNuggets with traces of oil-based solubles is cause for a boycott, but a 5 pound grilled cheese sandwich with 3 pounds of cheese and a mountain of vat-fried french fries is cause for relocating? I'm guessing you aren't very detail oriented, because you have it all wrong. I'm relocating for graduate school, not a sandwich, delicious though it may be. Also, I never said I was boycotting anything. I don't care if they are made of rubber bands, they are still delicious. Who cares? Crap contains water, the SAME thing that's in chicken mcnuggets. I remember years ago a commercial claimed that some pizza's cheese contained Casein, an ingredient used in glue! but what they didn't say is Casein comes from MILK! Sick, I'm never drinking water or eating cheese again. My Channel is called How's It Taste?